The Walking Dead gave its viewers an intense Season Seven trailer at Comic Con. What to expect? Flashbacks, Negan, and more comic characters coming to life. I love The Walking Dead. We have our differences sometimes, but the truth is, I look forward to October as soon as the season ends. These characters are flawed and sometimes plain wrong, but we somehow end up cheering for them anyway. We mourn with them and for them. This past week at San Diego Comic Con, The Walking Dead took over Hall H for its yearly trailer reveal and premiere date announcement. This year, Season Seven of The Walking Dead will premiere on October 23 at 9/8c with The Talking Dead resuming its counseling responsibilities directly after the episode. There’s no word yet on if the premiere will be an extended episode, but the past two seasons, the premiere has been 90 minutes long. Because of the content, I’m sure this announcement will eventually come around. For now AMC, has a couple of really cool things lined up for the series. August 14 at 10/9c, Chris Hardwick will host The Walking Dead Season 7 Preview Special. It will focus on the upcoming season and give behind-the-scenes access to the filming, and interviews with the cast and producers. October 16 at 9/8c, The Walking Dead Recap Special (working title) will air. This will be a retrospective of the entire series up until this point. The biggest part of Comic Con was the release of the trailer, though. If you haven’t seen it yet, here it is! I have to say, up until now, I hadn’t been all that excited about the Kingdom, but now that I’ve seen Ezekiel and Shiva, I’m THERE. 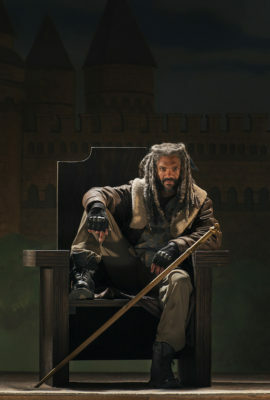 Welcome to the TWD Family, Khary Payton! The panel from SDCC is actually up online now! So, even though we might not have been there, we can watch Norman and Andy keep the glitter pranks alive! You can also visit AMC’s page for direct links to panel highlights! CLICK HERE! So, what do you think of the trailer and upcoming season? Share your theories!